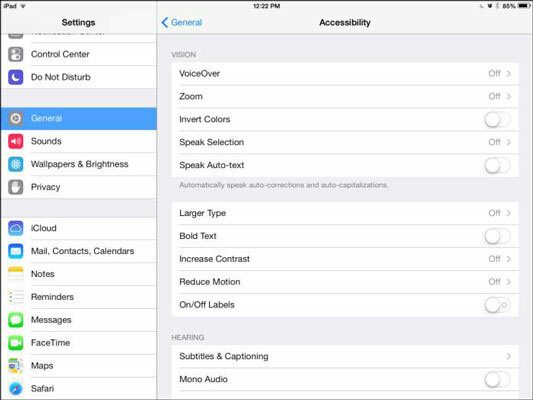 VoiceOver is one of the accessibility settings offered on the iPad. It reads the names of screen elements and settings to you, but it also changes the way you provide input to the iPad. In Notes, for example, you can have VoiceOver read the name of the Notes buttons to you, and when you enter notes, it will read words or characters you’ve entered. It can also tell you whether features such as Auto-Correction are on. Tap the Settings icon on the Home screen. Tap General and then scroll down and tap Accessibility. In the Accessibility pane shown in this figure, tap the VoiceOver button. In the VoiceOver pane shown in this figure, tap the VoiceOver On/Off button to turn on this feature. Tap the VoiceOver Practice button to select it, and then double-tap the button to open VoiceOver Practice. This is the new method of tapping that VoiceOver activates. Practice using gestures such as pinching or flicking left, and VoiceOver tells you what action each gesture initiates. Tap the Done button and then double-tap it to return to the VoiceOver dialog. Tap the Speak Hints field, and VoiceOver speaks the name of each tapped item. Double-tap the slider to turn off Speak Hints. If you want VoiceOver to read words or characters to you (for example, in the Notes app), tap and then double-tap Typing Feedback. In the Typing Feedback dialog, tap and then double-tap to select the option you prefer. The Words option causes VoiceOver to read words to you, but not characters, such as the “dollar sign” ($). The Characters and Words option causes VoiceOver to read both, and so on. Read the next task to find out how to navigate your iPad after you’ve turned on VoiceOver. You can change the language that VoiceOver speaks. In General settings, choose International and then Language and select another language. This action, however, also changes the language used for labels on Home icons and various settings and fields in iPad. 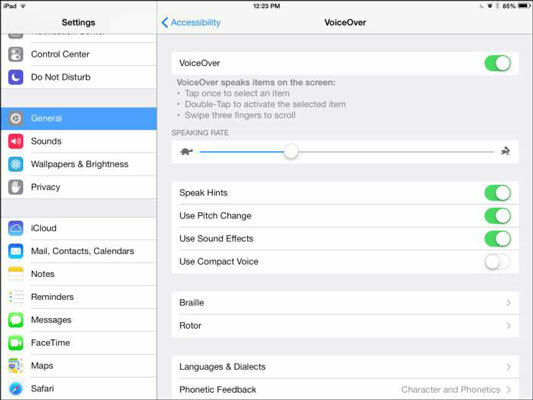 You can use the Accessibility Shortcut setting to help you more quickly turn the VoiceOver, Zoom, Switch Control, Assistive Touch, or Invert Colors features on and off. In the Accessibility dialog, tap Accessibility Shortcut. In the dialog that appears, choose what you want a triple-click of the Home button to activate. Now a triple-click with a single finger on the Home button provides you with the option you selected wherever you go in iPad.